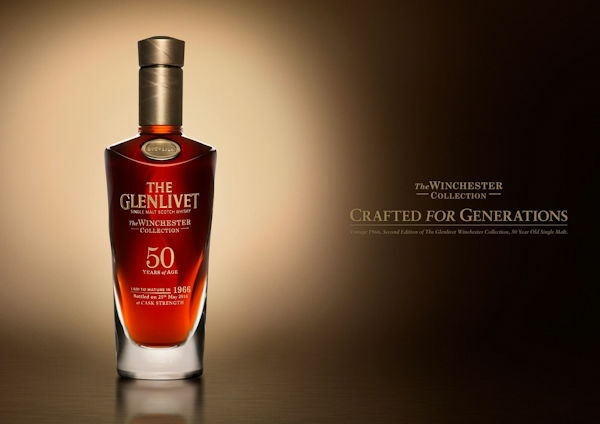 From October 2016, The Glenlivet is releasing the second edition in its series of 50 year old single malt Scotch whiskies: The Glenlivet Winchester Collection Vintage 1966. Crafted over generations, for generations to come, only 100 bottles of this liquid history, matured in an exceptional high quality sherry cask, will be released priced at $25,000 each. Created by The Glenlivet Master Distiller, Robert Arthur, in 1966, and subsequently cared for by the Master Distillers of The Glenlivet, it is released today under the guardianship of Alan Winchester. Vintage 1966 joins Vintage 1964 to become one of the rarest, exquisite and most sought after whisky collections in the world. Whilst this precious whisky has been resting in its cask the world has changed around it. Mankind took its first steps on the moon, the Berlin wall came down, and the world was introduced to the invention of the personal computer and mobile phone. Vintage 1966 was identified early on as being a cask of outstanding quality and has since been slowly and steadily developing the signature flavours that make The Glenlivet an enduring benchmark of quality. The trademark soft and sweet complexity is layered by a delicate cinnamon and liquorice spice, followed by an exceptionally long, smooth finish, with a hint of dryness. Alan Winchester’s own bottle will be auctioned at Christie’s on 21st October, alongside the unique opportunity to lay down Vintage 2016. Proceeds from the auction will go to the British Crafts Council to help champion craft for future generations. This commitment to craft runs through The Glenlivet Winchester Collection Vintage 1966 experience: The Glenlivet commissioned Brodie Nairn of acclaimed studio Glasstorm, to produce a hand blown glass bottle around the concept of water, paying homage to The Glenlivet’s Gaelic translation of ‘Valley of the Smooth Flowing One’, with elegant lines lending gentle movement to the sculpted glass. Designer silversmith Richard Fox crafted the gold stopper set with a smoky quartz Cairngorm Stone – specially selected to echo the richly dark liquid of Vintage 1966 – while esteemed wood craftsman, John Galvin, made the beautiful cherry wood cabinet that houses the whisky. 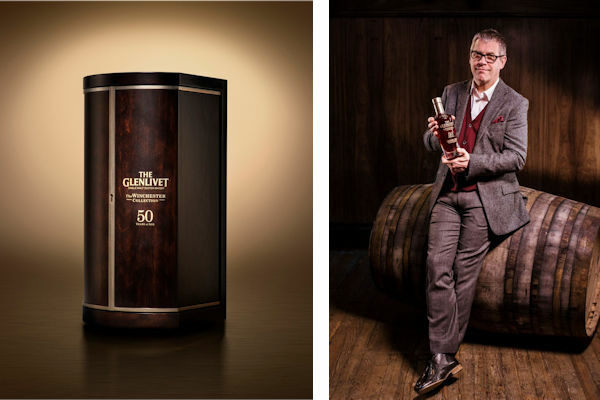 Alan Winchester comments: “The release of Vintage 1966 marks another milestone for The Glenlivet Winchester Collection. Casks of this age and quality are such a rare thing these days, that the resulting single malt is literally liquid history in a glass. I’m immensely proud to release this wonderful whisky, which has been cared for and crafted over generations. The Master Distiller’s bottle from The Glenlivet Winchester Collection, alongside Vintage 2016, will be auctioned out of Christie’s New York, on the 21st October, with a total of just 100 bottles to be made available for purchase worldwide. To find out more information about The Glenlivet Winchester Collection and to join The Guardians of The Glenlivet, visit www.theglenlivet.com/guardians.